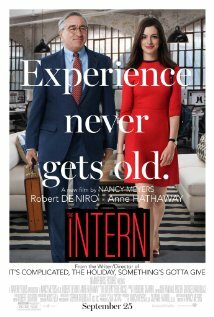 A 70-year-old retiree decides he wants to go back to work and becomes a senior intern at a fashion business. Ben Whittaker (Robert Deniro) is a widower and retired after 40 years as an executive at a phone book company (remember those)? He has done all of the things retired folks are supposed to do to get the most our of retirement - travel, tai chi, meeting for coffee, volunteering. But it's not enough. He's bored and misses going to work each day. So when he sees a flyer looking for senior interns at an up and coming online fashion company called "It's About the Fit," he jumps at the chance. The company is run by Jules Ostin (Anne Hathaway), and she is your typical Type-A personality. She is a working mother with a house husband (Anders Holm), oh, sorry, they are called "stay at home Dads" now, and an impossibly cute little girl (JoJo Kushner). Too cute, if you ask me, but then you know how I feel about precocious children in movies. Jules is overworked and things are starting to go wrong at the company, and the investors are calling for Jules to hire a CEO to oversee operations. She wants to do the right thing but also does not want to lose control of her company. And sadly, with little time for her husband and little girl, things are starting to go wrong at home too. Enter Ben with his impeccable work ethic and calm demeanor. The company is populated mostly with young geeky guys (Zack Pearlman, Adam Devine and Jason Orley) and they get a kick out of Ben and his "old ways:" He wears a suit and tie every day, carries a briefcase and a freshly laundered handkerchief (in case a lady needs it), is punctual, respectful and always seems to say the right thing. Soon, they are all coming to Ben for advice. He applies his hard-earned Baby Boomer values to the lives of the millennials and he helps them. Ben is assigned to be Jules' intern and at first she is not happy about it. She finds Ben "too observant," because she knows her life is falling apart. But Ben eventually works his magic on Jules too, which, if you asked me, happened a bit too quickly. But that's a minor detail. Written and directed by Nancy Meyers (who also wrote and directed "It's Complicated" and "Something's Gotta Give,") this film begs the questions: Can a millennial and a septuagenarian be best friends? Should working mothers have to pay the price? And does the older generation have something to teach the younger generation? Robert Deniro was never an actor one would associate with comedy until he had success with the "Meet the Fokkers" movies. Now we see him do more of these light comedies than the dramatic roles of his past. And he is getting the hang of it. He exudes warmth and charm and his chemistry with Hathaway is the best thing about this film. I couldn't help, though, but see a little homage to "Taxi Driver" and catch a glimpse of Travis Bickle when Ben was checking himself out in the mirror. I am not sure why Anne Hathaway has such a bad reputation in Hollywood for being fake and too perfect. I find her to be a luminous presence in films and she beautifully exudes pathos and warmth here. Renee Russo, who looks like she hasn't aged a bit, provides some love interest for Ben and Linda Lavin, as Ben's hot-to-trot neighbor, wishes she could. Other than some continuity issues and a farcical scene where Ben and a couple of the young guys he has befriended at the company break into Jules' mother's house, I liked this film and its messages. Just because you are old doesn't mean you should be put out to pasture. Likewise, a working mother doesn't deserve bad things to happen to her. It's a nice old-fashioned, beautiful-to-look at little comedy that we have come to expect from Meyers. Rosy the Reviewer says...a feel-good movie with two great messages: that working mothers should be applauded and the younger generation has much to learn from us old folks. You can't help but enjoy it! The Barden Bellas return and this time they must redeem themselves by winning an international competition no American team has ever won. 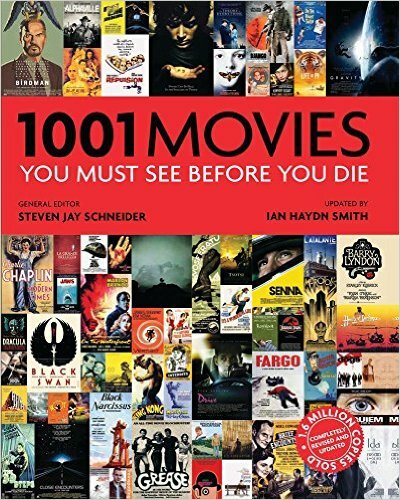 I realize I said that I was only going to review DVDs I could recommend, but I also said from time to time, I would warn you about bad high profile films that you might have been waiting to see. I did that with "Taken 3," and I am doing that here. Be forewarned. Our girls are back (Anna Kendrick as Beca; Brittany Snow as Chloe; Hana Mae Lee as Lilly; Alexis Knapp as Stacy; Rebel Wilson as Fat Amy) with a new girl, Emily (Hailee Steinfeld) to defend their three-time a cappella championships, but find themselves humiliated during a command performance for the President and First Lady when Fat Amy's pants split open while she is making a grand entrance hanging from some silk ropes thus exposing all of her naughty bits (she went commando). Because of this shame brought on the fictional Barden College, they are suspended from competing and cannot defend their National title. However through some strange twist of fate, it is decided that if they win an International competition, they will be reinstated. The school thinks this is a no-brainer because no American team has ever won this competition. Naturally the girls' biggest competition is a German group called, what else, "Das Sound Machine." Let the German stereotypes commence! There are side plots with Beca taking an intern job at a recording studio with a lunatic boss (Keegan-Michael Key, who does lunatic like no one else); Fat Amy's and Bumper's (Adam Devine) sort-of romance; and Emily wanting to follow in her mother's (Katey Sagal) footsteps as a Barden Bella. But it all isn't enough to save this film, which doesn't really have much to say and worse, it's not funny. The film has its usual energy and I applaud the fact that it depicts great female friendships, but that cannot replace a dreadful script that tries to save itself with raunchy humor and way over the top antics. Likewise the music is forgettable which is not a good thing for a movie about music. if you have been reading my reviews, you know how I feel about sequels . If you don't, then let me restate. Few sequels live up to the original, and in this case, the original wasn't really that good. It was a small, energetic, feel good movie that happened to come out when "Glee" was at its peak. That's great. I agree it was fun. But people, bask in the glory of a break-out one-note hit film, BUT DO NOT TRY TO REPEAT IT! Think of "Dumb and Dumber To." No, don't. I can't even bear to think of it. Anna Kendrick has had many successes since the first "Pitch Perfect" film, so one wonders why she is going backwards to be in this sequel. I also might be in the minority, but isn't her voice really nasally? And what happened to Hailee Steinfeld? Why is she here? I rest my case about really young actors being nominated for Oscars ("True Grit"). There is nowhere to go but down. And how many times do we need to see the fat girl falling down the stairs? Rebel Wilson needs to find a new schtick. Elizabeth Banks directed (her first full-length feature) and returns with a small quirky part as one of the commentators during the singing competitions. I have a lot of respect for Banks as an actress and her ability to play a wide range of characters, not to mention directing a film. I just wish it wasn't this film. Rosy the Reviewer says...if you enjoyed the first one, I think you will be disappointed here. You have been warned. And god help us, rumor has it that a "Pitch Perfect 3" is in the works. Oy. It's the end of the world as we know it and only one woman and two men survive. You know what they say about "Two's company..."
As the film begins, we see a person in hazmat gear rummaging around in an abandoned library stocking up on reading material. We soon realize it is a woman (Margot Robbie), Ann, a preacher's daughter, who has managed to survive the apocalypse in her little pocket of the world and she thinks she is the only survivor. But soon a man appears (Chiwetel Ejiofor). He has removed the radiation suit he arrived in after having survived in an underground lab and is taking a swim in a pond fed by a waterfall, not realizing it is radioactive water. Ann saves him, nurses him back to health, and though they are suspicious of each other, they form an uneasy alliance. Ann, meet John. John is a research scientist who has also managed to survive. Ann is living in a paradise in the midst of hell and John is happy to have found her. There is some sexual tension between them and a sort of romance ensues. Ann is hot to trot, but John uses restraint. He fears if they go further, it will change things for the worse. They are a post apocalyptic Adam and Eve, she believing that God has a reason for their situation and he, an atheist. But despite their differences, they eke out a life together and John proposes making use of the waterfall for power by building a water-wheel. To do that, they would need to tear down the church on the property and use the wood. Conflict occurs as Ann is devout and it's her father's church. But then some ominous music ensues. Ann and John, meet Caleb (the handsome and intense Chris Pine). And three's a crowd. Based on the post-apocalyptic science fiction book by Robert C. O'Brien adapted by Nissar Modi and directed by Craig Zobel, the film doesn't do a very good job of explaining the title, which comes from a set of alphabet bible stories that Ann has. The first one is "A for Adam," and it calls him the first man on earth. 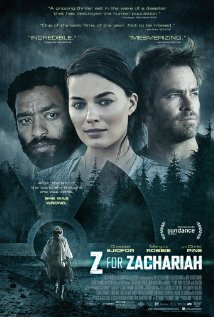 We are supposed to know that Ann assumes the last book, "Z for Zachariah" means that Zachariah is the last man on earth. However, Zobel, whose first film was the powerful "Compliance," once again explores the themes of power and authority and does a good job of presenting these three wonderful actors as they deal with race, religion, jealousy and passion. Even without makeup, Margot Robbie is gorgeous. That's what good bone structure does. And here she plays against the sexpot characters we have come to expect. Ejiofor can always be counted on to put in a great performance and this is no exception as his character comes to grips with his situation. Pine has a James Dean quality that works well here as his intensity intensifies the emotions he and John feel as they vie for Ann's affections. Is he the snake in Eden? This film reminded me of an "end of the world" "Days of Heaven," where Richard Gere, Sam Shepherd and Brooke Adams formed a tragic three-some. Rosy the Reviewer says...an engrossing, engaging thriller that didn't get the viewers it deserved. In the waning days of WW II, a group of Tuscan peasants flee in search of the soon-to-arrive American liberators just as the Nazis plan to bomb their village. Narrated by a mother talking to her sleeping child, she remembers when she was a six-year-old child and her village was controlled by the Nazis and Fascist collaborators. The film begins with a hasty marriage. It's hasty in part because the bride is pregnant but it's also hasty because the Nazis are nearby and the villagers fear for their lives. The marriage takes place and then everyone scatters and goes back into hiding in the basement of a building where a sort of microcosm of village life has evolved. The Germans have ordered that everyone gather at the church as certain buildings that have been marked with a green "X" will be bombed at 3am. Anyone outside the church at night will be killed. Fearing it's a trap to kill them if they go to the church, Galvano (Omero Antonutti), a village elder, exhorts the villagers to follow him into the hills to find the American liberators. Half of the villagers stay behind, half follow Galvano. Galvano and his band encounter other villagers, once their friends, who are now Fascist collaborators and a bloodbath ensues. Later, the surviving villagers hear the sounds of the bombs going off in their village. 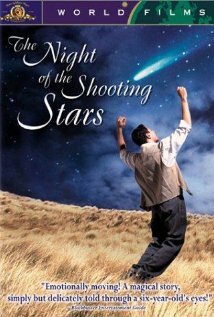 "The Night of the Shooting Stars," also known in Italian folklore as the "Night of San Lorenzo," is the night that dreams come true, which is a cruel irony considering what the fleeing villagers go through that night. And the lush cinematography by Franco Di Giacomo captures the gorgeous Tuscan countryside which is in sharp contrast to the atrocities of war that take place there. Why it's a Must See: "[This film] is the masterwork of the Taviano Brothers, Paolo and Vittorio...Notable for its ensemble cast, [it] offers indelible images to salve the etched memory of unwanted conflict. A cathedral is bombed to kill worshipers...Friends on opposite sides of a political divide murder one another. Two older people consummate a love affair decades in the making. Together these moments signify the gravity of World War II while remembering the dignity of everyday life." This film was voted the best film of the year in 1982 by the National Society of Film Critics. Rosy the Reviewer says...a poetic little film that celebrates the common man (and woman) and the power of the human spirit. 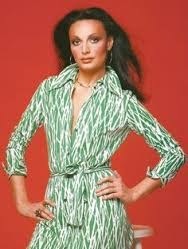 Diane Von Furstenberg burst onto the fashion scene in the 1970's with her little wrap dress, for which she became famous. Before that she was a young Belgian girl whose mother had survived the holocaust. At boarding school she was introduced to Prince Egon of Furstenberg, thus making her a princess. They were young and beautiful and embraced by the international jet setting/Studio 54 scene. but Diane wanted more. "The minute I knew I was about to be Egon's wife, I decided to have a career. I wanted to be someone of my own, and not just a plain little girl who got married beyond her desserts." Come to find out both an autobiography and a biography came out about Diane in 2015. One thing you can count on for most celebrity autobiographies is that most of the time, they will not be as juicy as their biography counterparts as celebrities try to show themselves in the best possible light and hide the embarrassing stuff. So I thought it would be fun to read both of them and compare. Will Diane share the juicy and/or embarrassing parts of her life that might be revealed in the biography? 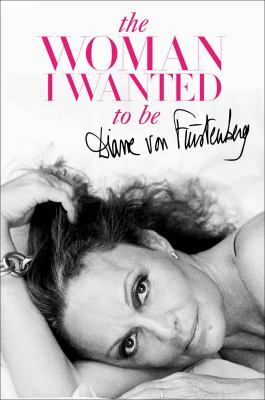 I found Diane's autobiography, "The Woman I Want to Be," quite candid, though less than 100 pages made up the sum of her life. But that's probably because this is her second memoir and she covered the particulars of her life up to 2009 in her first book "Diane, A Signature Life." She reminds us of her affair with Richard Gere and the sacrifices she made to be with the men she loved and her eventual marriage to billionaire Barry Diller, the guy who was there all along. But the bulk of this second book consists of her observations about life, her philosophy of beauty, the models she has known, losing her company, her comeback and what she has learned from all of that. She is an avowed feminist and doesn't believe in fear. She believes in living a fearless life and it appears she has done just that. Diane gives her mother a great deal of credit for her becoming the woman she wanted to be and her motto is "Love is life is love is life." She has used this slogan in ad campaigns and on accessories. However, her son, Alex, who is an executive in her company asks "What the f**k does that even mean?" But she stands by it by saying "I believe in the circle of love. All of the generosity and love you put out in to the world over the decades comes back to you. I'm benefiting now from being nice my whole life." And it must be true. On the TV show, as in her memoir, she comes off as very wise, worldly, confident, warm...and nice. As for Diliberto's biography, one wonders why this was published the same year as Von Furstenberg's second memoir. 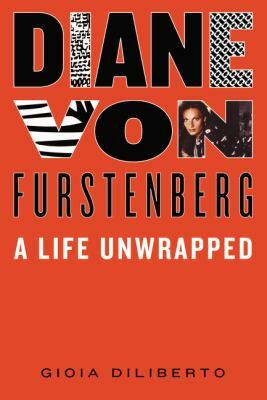 It is not an unauthorized biography as Diane cooperated with the author, so there really isn't any juicy stuff here that Von Furstenberg hasn't already revealed about herself except perhaps a few more details on her lovers. Diliberto also acknowledges how much Diane is liked by those she has known. But basically it's a clone of the first and second memoirs by Diane herself and reveals nothing new. Von Furstenberg is now 68 and has fame, fortune, a happy marriage, grandchildren, a yacht...yet she shows no signs of slowing down. As her son Alex says in Diliberto's book, "She wants to be as big as Chanel," which in the fashion trade means "a brand with soul," a phrase that refers "to brands that transcend their products and stand for shared values with a community of consumers." So between the two books...it just depends if you want an account of Von Furstenberg's life by a second party or if you want an account of her life from the lady herself with her advice on how to live your life fearlessly and fully thrown in (and for more details on her life, you could add the first memoir). If you are interested in fashion and/or the story of a successful woman who made it in an industry where "one day you are in and one day you are out," you will enjoy reading about Von Furstenberg. Rosy the Reviewer says...Of the two, I choose the memoir(s). The Intern sounds like my kind of movie! I don't understand the nastiness directed at Anne Hathaway either. What's with that? I liked the original Pitch Perfect but I don't get why vomit scenes are so popular in movies now. I have a very sensitive gag reflex ;) I'll go with your recommendation on the sequels tho. I am not much of a fashionista but the Furstenberg biography sounds interesting. I bet she and Iris have much the same philosophy...will put the book on hold. I have Tim's Vermeer in my hot little hands for my weekend viewing. Will report in after I watch it. Yes, please do on Tim. I did a little background checking and there was a quite big backlash about the movie and whether or not he painted anything at all resembling a real Vermeer! But I still found it a fascinating little documentary. Based on your recommendation, I saw The Intern yesterday, and loved it! Great message about the value of experience (if only those who are less experienced are willing to accept the wisdom!) It was a sweet "buddy" movie with an unlikely pairing, but it worked! Also, you just can't beat a Nancy Meyers movie for amazing, envy-worthy sets. Thanks for the suggestion. Thanks for your review, Susan. Glad you liked it!